Our Philosophy | Sentry One Consulting Group, Inc. While Sentry One has the ability to conduct consulting, site evaluations and training for any type of commercial business we choose to focus on the church arena because that is where our passion lies. Our efforts started many years ago as a ministry and only became a business in 2011 because the demand became so great… but the heart of this company is still rooted in that passion. It is an often overlooked fact that there are always more people coming to your church that are deeply hurting than those that would show up with the intent to hurt someone else. With that in mind why would you not build your Safety Team to be the tip of the spear for that ministry outreach? This approach allows them to exercise their training every time the doors are opened and not just when a safety issue occurs. This is also why the screening for Safety Team members should be accomplished with ministry skills in mind. The challenge when building any type of team is how to motivate them to be their best on a consistent basis. Training and practice is clearly a critical component to that equation but getting volunteers to be consistent with training and practice in addition to their families and other duties is always a struggle. This leads to the need to build a “culture of training” which in itself inspires each team member to have a strong drive to participate. In turn this drive to participate in the training also translates into a drive to actually show up and do the job each week. We do not just build a training program but we indeed develop a culture of training that allows the team to be self sustaining long after we have departed. Crime can occur against a single church but more often it moves through a community. Even if it is a single event at a single church it still affects the body as a whole. Why then would we not reach out and share our training and intelligence gathering with the other churches in our community. What a great opportunity for churches even across denominational lines to build relationships. Our goal will always be to help facilitate that concept as we work with an individual church. “Safety” is a comprehensive term encompassing the entire safe-keeping picture and security is only a small part of that picture. In addition, the active shooter situation is even a smaller portion of the small security picture. All of these issues need to be addressed but it is imperative that we keep the big picture in balance. There is a difference between teaching, training and practice. You need them all to be effective at the job. Teaching is bringing the information to the student, training is using that information to make sure the student knows how to complete the task, practice insures that the student can do the task instinctually in the time of crisis. Your team’s biggest enemy will be the day to day routine. To battle that over the long haul you must create a “culture” of training. You can have a well trained team of combat ready members but if their weekly routine is crisis free for months or years at a time their skills and reaction time will deteriorate. Stimulating and reality based training on a regular basis is the only cure for this principle. The role of a church safety officer is no less important than that of an Elder or Deacon and should be held to the same biblical standards. 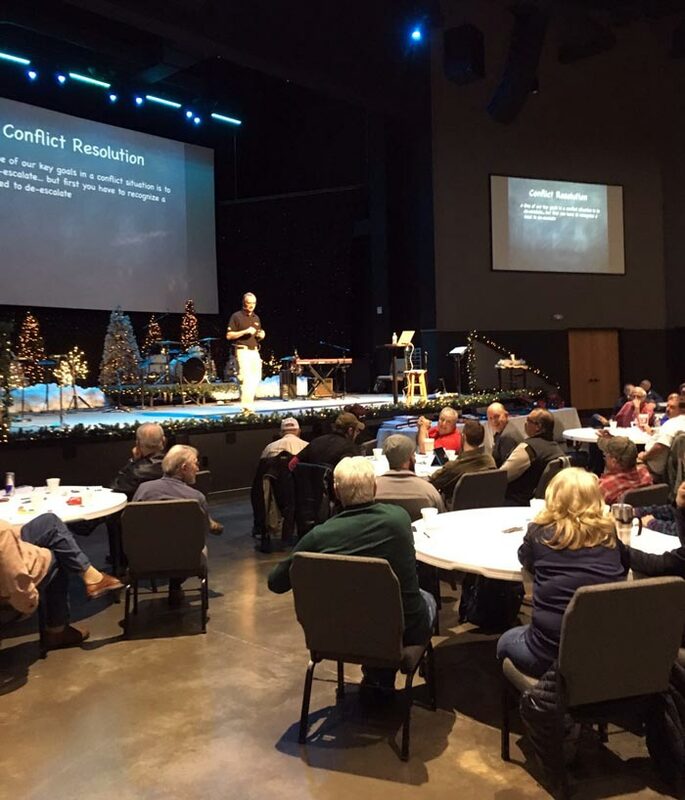 Your Safety Team needs to be the tip of the spear of your outreach to hurting people and as such will be on the front line of any event designed to hurt the church. The effectiveness of your team in general but especially in a crisis depends largely on how they conduct themselves day in and day out. This simply means your team need be perceived as well trained and professional or the flock will not follow them in a crisis. That perception is only achieved by actually being well trained and professional day in and day out. Your church needs to be safe 7 days a week and not just on Sundays. The church staff often has their plates full with the obligations related to ministry and church administration. Therefore, a well trained Safety team can and should be the flag bearer for all things “safety” both on service days as well as during the work week. It is a novel thought indeed that churches would actually work together (even across denominational lines) for a common cause like the safety of their members. This is a self explanatory concept but I rarely see it played out. I cannot answer why that is the case but it is our goal to rectify it every opportunity we get. It is a Novel Thought Indeed that Churches Would Actually Work Together for a Common Cause Like the Safety of Their Members.